The Mini Clock XL is a great choice for covert video on a budget. Our line of mini clock cams are a customer favorite. 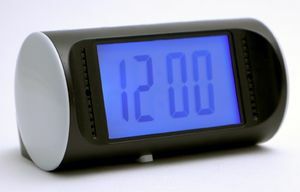 This fully functional alarm clock is larger than our other models, allowing it to better act as a primary alarm clock. The switch on the side also works to turn the entire unit on and off, conserving battery life when not in use. High resolution video. Records both audio and 720 x 480 clear color video. Multiple settings including motion detection. Use the remote control to choose between motion detection, audio only, and continuous recording settings. Lengthy battery life. The included Li-Ion battery lasts for up to 10 hours on one charge. Easy file transfer. Store up to 32GB of data on MicroSD*. Whether you're looking for a nanny cam or to keep watch on your room while you're away the Mini Clock Cam XL is a reliable and economical choice.